You bump into someone, out of the blue, and they provide you with information that changes the course of your life. Coincidence? An accident? No. A Godwink, to be sure, but it’s something bigger. In my new book, Divine Alignment™, I offer the thesis that we are interconnected by God’s invisible threads — person to person, Godwink by Godwink — as our lives unfold on a grand GPS: God’s Positioning System. I submit that if you place yourself in alignment with God, and step out in faith for what you believe to be your destiny, He will place people and events all along your pathways to help you get where you’re going. Moreover, your journey will be lined with signs — Godwinks — as little messages of reassurance. Let me illustrate with this uplifting story from the new book. Louise perhaps had no conscious notion that she was actually starting to map her path in life — heading for what she believed to be her destiny — but she was doing exactly that by trying out for school plays, hanging with other kids with artistic inclinations, and, most importantly, never missing her favorite Saturday night TV show starring Carol Burnett and those wacky sidekicks Tim Conway and Harvey Korman. She’d study the range of characters that Carol came up with every week and try to imitate her. She would also talk with God about her heroine. Every week, Louise’s mother gave her a quarter and sent her to the Catholic church to light a candle and pray for the souls in purgatory. Does God hear the prayers of a little girl? Well, it usually doesn’t happen overnight like in an old black-and-white movie, because for Divine Alignment to unfold, God has a lot of pieces of the puzzle to put into place. But as far as Louise was concerned, she just kept on praying that she’d one day meet the star of her dreams. Eventually Louise had the opportunity to go to California, and found herself in a show where she could imitate her heroine, and, with uncanny ability, she even replicated Carol Burnett’s trademark Tarzan yell. From God’s perspective, way up above the puzzle pieces on the table of Louise’s life, perhaps everything was now in proper position for a Divinely Aligned Godwink. A producer who worked with Carol somehow saw a videotape of Louise and showed it to her. A short while later, Louise’s phone rang. 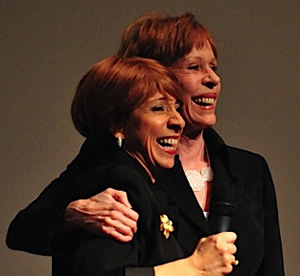 It was — Carol Burnett, inviting her to the studios for lunch. You could have knocked Louise over with a feather! 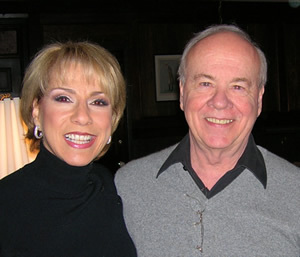 For over a decade now she has costarred onstage all across America with Tim Conway — and, until he died, Harvey Korman. Divine Alignment plays the same kind of role in your life too, if you allow it. 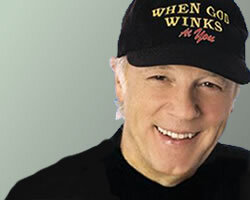 It’s when you learn to acknowledge your Godwinks as part of a larger pattern of Divine Alignment — which I’ve developed through seven simple steps — that this concept becomes more and more apparent, proving, without doubt, that you are never alone; and that God has always got you on His GPS. By the way, that charming girl in saddle shoes who can imitate scores of celebrities — Louise DuArt — is my wonderful wife. And, believe me, my life IS a picnic: I never know who I’m waking up next to. Click for more Godwinks from Homecoming contributor SQuire Rushnell!